Why Should I Add 600 DPI Scanning? 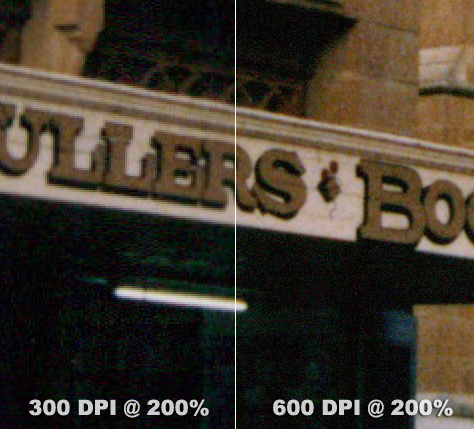 The quick answer is that higher resolutions lead to better scans for reproducing your images. 600 DPI scans produce much larger files but help ensure every detail in your print is recorded in digital form. If you want to be sure as much detail as possible is captured during scanning, add 600 DPI scanning for an additional 13¢ per scan. If you want files that are easier to work with, 300 DPI scans would be a better choice. 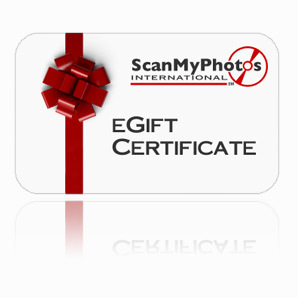 Part of the benefit of scanning your old photos, in addition to the added security of backing them up in a digital format, is the ability to create new prints, enlargements and photo products such as photo books. The quality and size of the prints you will be able to reproduce will depend upon both the quality of the original photo and the resolution the photo is scanned at. See the charts below for a guide comparing original print size, resolution and reproduction size. Scanning at a higher DPI will give you more options for reprints and copies to be passed down to future generations. *Our recommendations are based ONLY on resolution. Final reproduction quality is based on overall quality, clarity and exposure of the original image. Fair Rating based on 150 DPI image resolution/size. Good rating based on 225 DPI image resolution/size. Great rating based on 300+ DPI image resolution/size. NR is not recommended.